Velvety handle with clean skin and manicurednails always amaze, and not just because it is attractive. 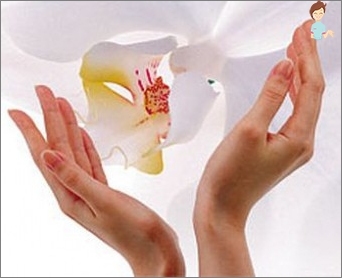 Soft hands, without cracks and burrs - is one of the signs of health and caring attitude to your body. What kind of care for your hands and nails need you? Learn all about the beauty of your fingers - from hygiene to aesthetics. In ordinary representation of attractive femalePens - clean, warm, with evenly cut nails, which can be covered with colored lacquer or hygiene. It would seem, nothing complicated about it, but women always have to fight almost daily with cracks on the cuticle and callous skin, possibly with blisters and abrasions, as well as worry about the state of the nails. Particularly affected without leaving women workers,mothers with young children, housewives and lovers of gardening and horticulture. But no less influenced by everyday factors - exposure to water, cold, wind, and even the general condition of the body, such as a lack of vitamins. Because of them, the skin becomes dry and rough,which not only looks ugly but also can lead to the formation of cracks and painful stimuli. Pens in this way will not save any fashionable lacquer or decorations. Thus, skin care is in the hands of a constant hydration and nutrition, manicure and timely removal of peeling, blisters and scratches. Up to 22-23 years is usually enough natural moisture,but with age it becomes absolutely necessary to use a cream and nourish the skin on a regular basis. Use one or more home remedies recipes care. A warm bath with soothing and healingcomponents will help relieve fatigue, heals micro cracks and perfectly clean. Not to mention the fact that it is a very pleasant procedure. Take baths with the addition of cosmetic and essential oils, is well suited for this purpose oil peach or grape seed, almond, avocado, shea butter, cocoa, sesame. From essential choose lemon, ilangovoe,fir, jasmine, geranium, and if have more funds, the Rose. 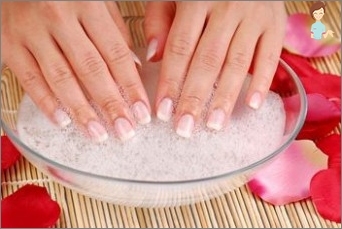 You can do the bath with iodine for strong nails, but they are a little dry skin. A decoction of herbs is also perfectly suitable: brew in equal parts of chamomile, oregano, sweet flag, bay leaf and calendula, strain and add to the tub for gentle and healthy hands. Massage Brush helps to relax the muscles to restjoints and ligaments, improves blood circulation and prevent Raynaud's syndrome - cold pale hand. For a 10-minute massage using one of the oils or slightly greasy cream. If your hands are freezing frequently, not only to rub the brush, but the wrist and forearm. Mask nourish, moisturize and soften rough skin. Excellent effect gives paraffin mask (sold in pharmacies beauty). To speed the healing of cracks, trystick round hands warm beeswax - it can be purchased from beekeepers, without fear of non-natural additives. Wax contains healing and moisturizing agents, in addition, it is very clean and is a natural antiseptic. Bleaching and Purifying Mask of oatmealMore and nourishes the skin. Brew flakes small amount of boiling water, let cool slightly and apply the slurry for 20 minutes. After this mask do not forget to put a fat cream - it's a little dry. Honey mask smoothes and nourishes,prevents cracks and burrs. A more candied honey and gently exfoliate skin. One teaspoon of honey is enough - spread it on the hands and massage for five minutes. Washing off the mask, do not try too hard - just get rid of the stickiness without soap, to the remnants of honey a little more acting on the skin. Mask with the pulp of aloe soothe irritation,cause sunburn, household cleaning products or windy weather. Having a house plant aloe - a big plus, because it leaves you can regularly get raw materials for cosmetics and household treat simple sore throat. Cut leaf aloe, soak it in a refrigeratorthree days, remove skin and chop the flesh transparent. Gruel with juice, apply a simple gauze bandage, soak 20 minutes. Rinse off the mask is not necessary, but use a cream to be very good. 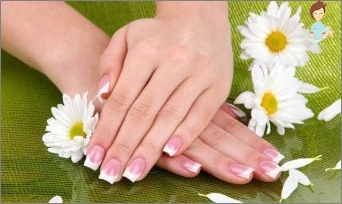 All the procedures described above are well looked afterand for nails and cuticles. A special spa treatment for hands and nails, you can pamper yourself, if you buy a cosmetic Dead Sea mud mask instead of the home, which tightens the cuticle, saturates trace elements, tones and heals the cracks. This product can be simultaneously exfoliating and mask. Excellent acting combination of dirt and oils. You can find the finished composition from the manufacturer or mix it yourself (using a list of essential oils above). After this procedure, do not rush to apply the paint -on oily and wet the surface of the nail, he falls ill. Transfer the design on the next day, or wait at least an hour and then wipe degreaser nails (nail polish remover or alcohol). In the care of the hands after garden also has itsFeatures - it thorns and splinters, glaring into the skin after work in the beds, and small wounds and scratches. The dirt that gets into the wounds, can cause inflammation, so it is better to work in special knitted gloves. When scratches and pinholes should be quicklywash your hands and wipe the place of damage alcohol, hydrogen peroxide, iodine or brilliant green, seal the plaster. If you know that from the garden to the house away, carry Zelenka in pencil - a convenient means to disinfect wounds. It happens that the wound still festered, for example, by remaining in her thorns or particles of the earth. Grease cream inflamed sores can not be in any case. Keep fingers or hands in salt water roomtemperature (1 tablespoon of salt per 0.5 liter of water) until you feel a slight tingling or burning sensation - this means that the salt cleaned the wound. If inflammation of 3 days had passed, contact your surgeon. Very often sap stain hands, and these spots are impossible to wash with soap. repeatedly rinse hands in water with iodine solution (1 teaspoon per liter) - this will destroy the natural oxidant and slightly brighten the skin organic compounds plant juice. After these procedures, you may receive a feeling of tightness, so apply a thicker cream. Reinforced hand care needs and those who havework involves regular contact with dust, water and excessive tension of the skin of hands - a librarian, cashiers, sellers, seamstresses, cooks, craftsmen and porters. For them it is very important to keep your hands warm(Work in the mittens, gloves, use a warming ointment, just bask in from time to time), and always use so-called cream gloves that create a protective layer on the skin (creams with silicone, spermicidal, glycerol). It is interesting that vegans in the initial period of the new diet for the body your skin, Feet, elbows and lips begin to peel and crack. It comes from the increase in the diet of vegetable dishes, and rich in vitamins the body is mainly due to superabundance of vitamin A. In this case, do not panic, it is betterbe patient and wait until the body is reconstructed on plant food. Meanwhile, dry areas need more than usual emollient cream to lubricate and prevent the formation of cracks in the skin. Keep your arms and fingers, take care of them and they always let you pleased with its healthy appearance!